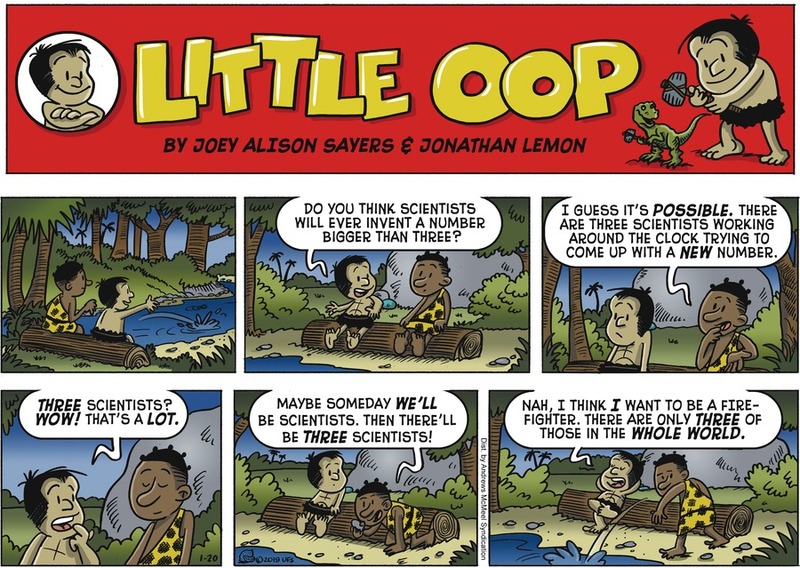 Two of the four comic strips I mean to feature here have credits that feel unsatisfying to me. One of them is someone’s pseudonym and, yeah, that’s their business. One is Dennis the Menace , for which I find an in-strip signature that doesn’t match the credentials on Comics Kingdom’s web site, never mind Wikipedia. I’ll go with what’s signed in the comic as probably authoritative. But I don’t like it. R Ferdinand and S Ketcham’s Dennis the Menace for the 16th is about calculation. One eternally surprising little thing about calculators and computers is that they don’t do anything you can’t do by hand. Or, for that matter, in your head. They do it faster, typically, and more reliably. They can seem magical. But the only difference between what they do and what we do is the quantity with which they do this work. You can take this as humbling or as inspirational, as fits your worldview. R Ferdinand and S Ketcham’s Dennis the Menace for the 16th of September, 2018. I know it’s a standard bit of Dennis the Menace snarking to rate Dennis’s actual menacing nature. But forcing his father to show that he’s lost his proficiency at arithmetic in the guise of helping him? … It’s kind of a long-game bit of menace, I suppose. Ham’s Life on Earth for the 16th is a joke about the magical powers we attribute to mathematics. It’s also built on one of our underlying assumptions of the world, that it must be logically consistent. If one has an irrefutable logical argument that something isn’t so, then that thing must not be so. It’s hard to imagine how an illogical world would work. But it is hard not to wonder if there’s some arrogance involved in supposing the world has to square with the rules of logic that we find sensible. And to wonder whether we perceive world consistent with that logic because our expectations frame what we’re able to perceive. Ham’s Life on Earth for the 16th of September, 2018. Raise your hand if you’ve been there. Hah! You’re fibbing. In any case, as we frame logic, an argument’s validity shouldn’t depend on the person making the argument. Or even whether the argument has been made. So it’s hard to see how simply voicing the argument that one doesn’t exist could have that effect. 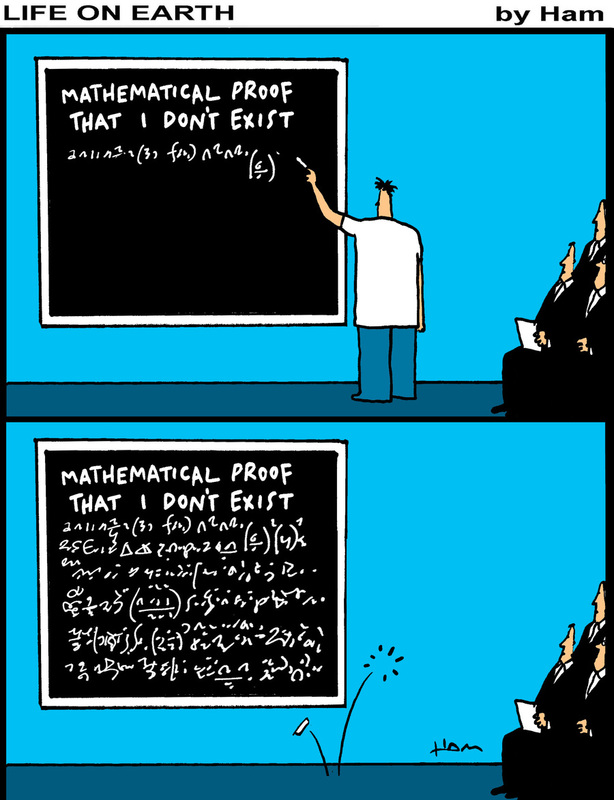 Except that mathematics has got magical connotations, and vice-versa. That’ll be good for building jokes for a while yet. Mark Anderson’s Andertoons for the 17th of September, 2018. So is this a substitute or does Wavehead just have a new mathematics teacher? 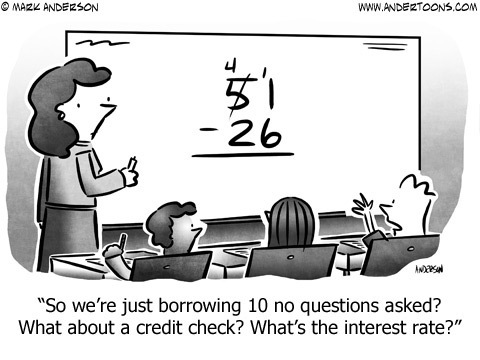 Mark Anderson’s Andertoons for the 17th is the Mark Anderson’s Andertoons for the week. 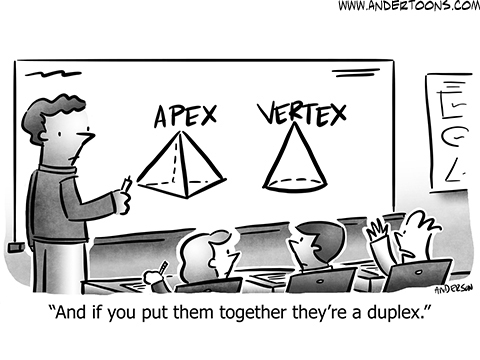 It’s wordplay, built on the connotation that division is a bad thing. It seems less dire if we think of division as learning how to equally share something that’s been held in common, though. 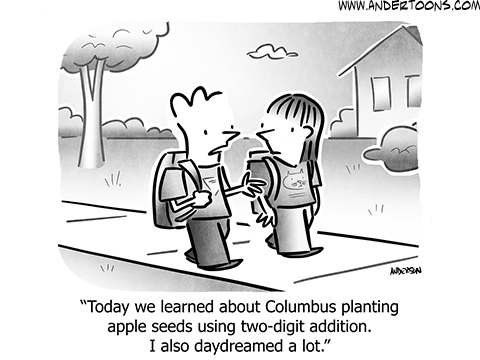 Or if we think of it as learning what to multiply a thing by to get a particular value. 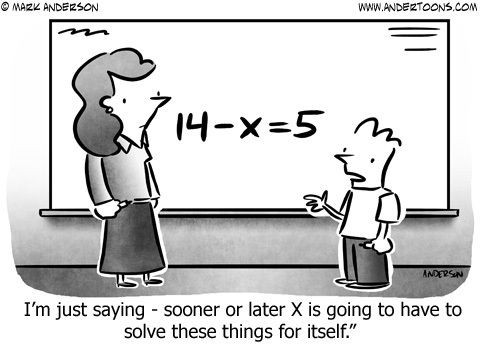 Most mathematical operations can be taken to mean many things. 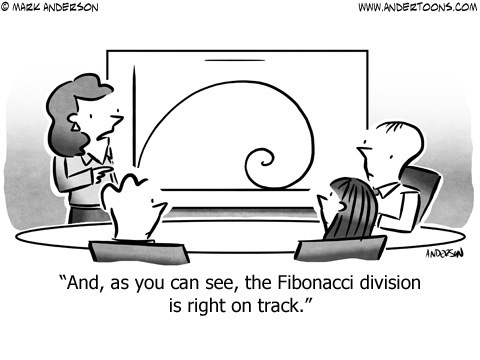 Surely division has some constructive and happy interpretations. Paul Gilligan’s Pooch Cafe for the 17th of September, 2018. For my money the cat hasn’t walked across the keyboard right if it hasn’t got you Freakazoid powers. Paul Gilligan’s Pooch Cafe for the 17th is a variation of the monkeys-on-keyboards joke. If what you need is a string of nonsense characters then … well, a cat on the keys is at least famous for producing some gibberish. It’s likely not going to be truly random, though. If a cat’s paw has stepped on, say, the ‘O’, there’s a good chance the cat is also stepping on ‘P’ or ‘9’. It also suggests that if the cat starts from the right, they’re more likely to have a character like ‘O’ early in the string of characters and less likely at the end. A completely random string would be as likely to have an ‘O’ at the start as at the end of the string. And even if a cat on the keyboard did produce good-quality randomness, well. How likely a randomly-generated string of characters is to match a thing depends on the length of the thing. If the meaning of the symbols doesn’t matter, then ‘Penny Lane’ is as good as ‘*2ft,2igFIt’. This is not to say you can just use, say, ‘asdfghjkl’ as your password, at least not for anything that would hurt you if it were cracked. If everyone picked all passwords with no regard for what the symbols meant, these would be. But passwords that seem easy to think get used more often than they should be. It’s not that they’re easier to guess, but that guessing them is more likely to be correct. Later this week I’ll host this month’s Playful Mathematics Blog Carnival! If you know of any mathematics that teaches or delights or both please share it with me, and we’ll let the world know. Also this week I should finally start my 2018 Mathematics A To Z, explaining words from mathematics one at a time. And there’ll be another Reading the Comics Post before next Sunday. It and all my other Reading the Comics posts should be at this tag. Other appearances of Dennis the Menace should be at this link. This and other essays mentioning Life On Earth are at this link. The many appearances of Andertoons are at this link And other essays with Pooch Cafe should be at this link. Thanks for reading along. I apologize for the ragged nature of this entry, but I’ve had a ragged sort of week and it’s all I can do to keep up. Alert calendar-watchers might have figured out I would have rather had this posted on Thursday or Friday, but I couldn’t make that work. I’m trying. Thanks for your patience. Mark Anderson’s Andertoons for the 17th of August, 2018. Also so I guess now we know Wavehead’s teacher’s name. Please make a note so that when I forget this you can tell me and I’ll act like it’s a discovery. 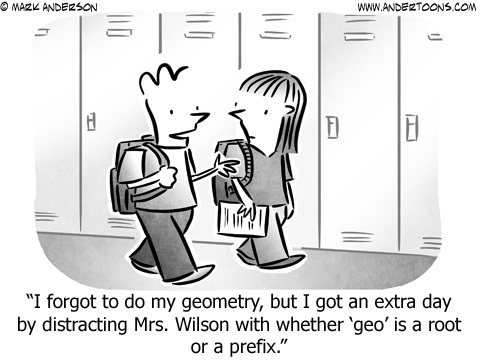 So I’m not sure how real word-studyers would regard the “geo” in “geometry”. 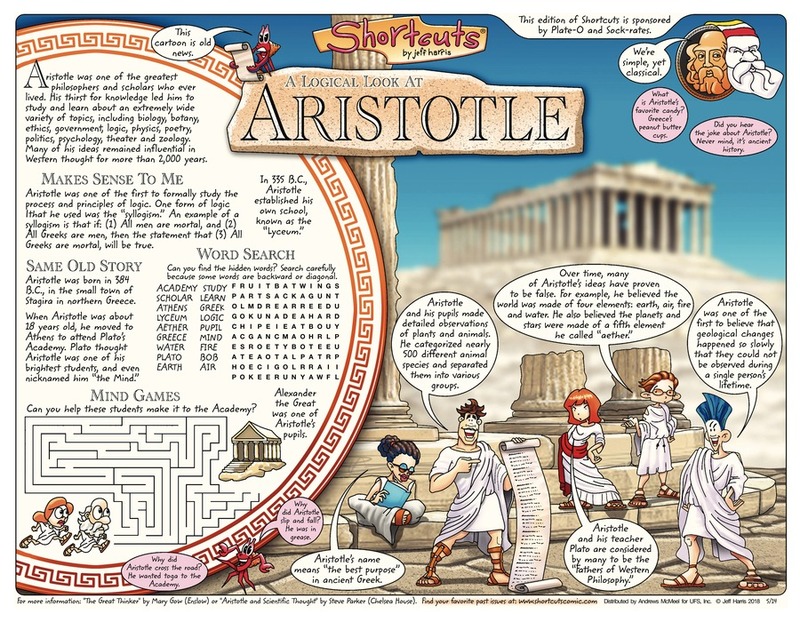 The word is more or less Ancient Greek, given a bit of age and worn down into common English forms. It’s fair enough to describe it as originally meaning “land survey” or “land measure”. This might seem eccentric. But much of the early use of geometry was to figure out where things were, and how far they were from each other. It seems likely the earliest uses, for example, of the Pythagorean Theorem dealt with how to draw right angles on the surface of the Earth. And how to draw boundaries. The Greek fascination with compass-and-straightedge construction — work done without a ruler, so that you know distance only as a thing relative to other things in your figure — obscures how much of the field is about measurement. Brett Koth’s Diamond Lil for the 17th of August, 2018. Will admit that I’m at the stage in life that social clubs I don’t have to actually do anything for sound attractive. 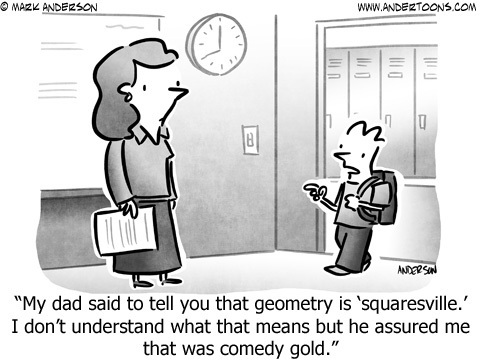 Brett Koth’s Diamond Lil for the 17th is another geometry joke, and a much clearer one. And if there’s one thing we can say about parallel lines it’s that they don’t meet. There are some corners of geometry in which it’s convenient to say they “meet at infinity”, that is, they intersect at some point an infinite distance away. I don’t recommend bringing this up in casual conversation. I’m not sure I wanted to bring it up here. Johnny Hart’s Back to BC for the 18th of August, 2018. It originally ran the 21st of February, 1961. Johnny Hart’s Back to BC for the 18th is … hm. 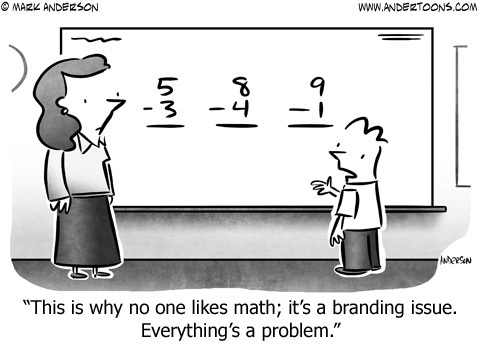 Well, I’ll call it a numerals joke. 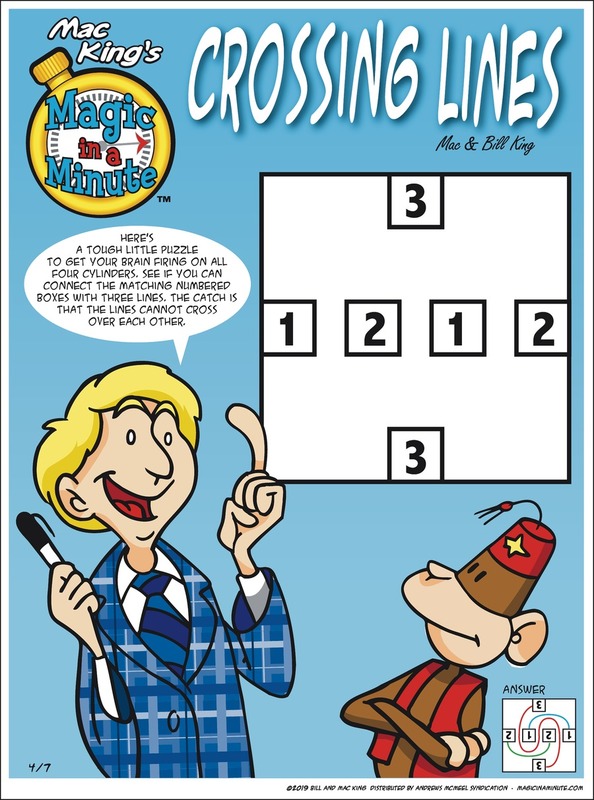 It’s part of the continuum of jokes made about ice skating in figure-eights. 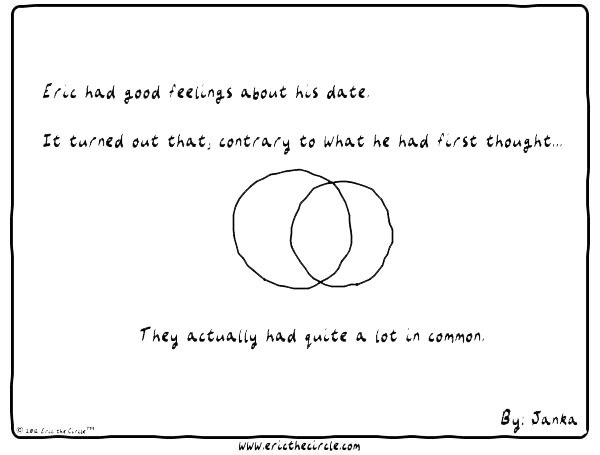 Other essays about comic strips are at this link. When I’ve talked about Andertoons I’ve tried to make sure it turns up at this link. Essays in which I’ve discussed Diamond Lil should be at this link when there are other ones. Turns out this is a new tag. The times I’ve discussed B.C. , old or new, should be at this link. 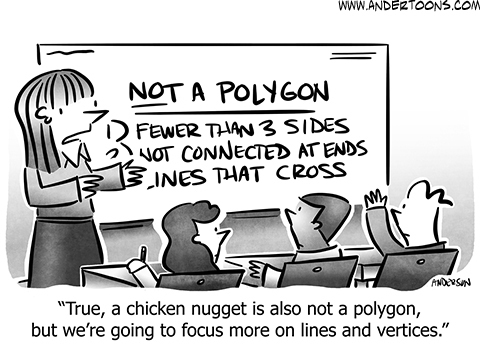 There’s really only the one strip that I talk about today that gets into non-Euclidean geometries. I was hoping to have the time to get into negative temperatures. That came up in the comics too, and it’s a subject close to my heart. But I didn’t have time to write that and so must go with what I did have. I’ve surely used “Non-Euclidean Geometry Edition” as a name before too, but that name and the date of August 2, 2018? Just as surely not. Mark Anderson’s Andertoons for the 29th is the Mark Anderson’s Andertoons for the week, at last. 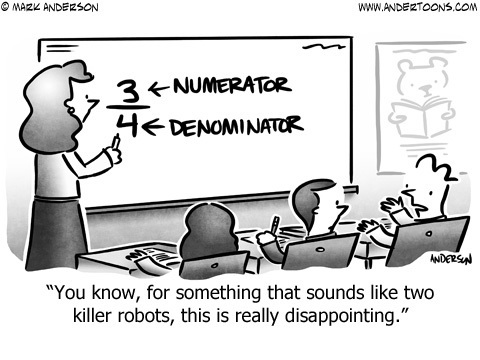 Wavehead gets to be disappointed by what a numerator and denominator are. Common problem; there are many mathematics things with great, evocative names that all turn out to be mathematics things. Mark Anderson’s Andertoons for the 29th of July, 2018. Poor Wavehead is never going to get over his disappointment when he learns about the Fredholm Alternative. I still insist it’s an underrated mid-70s paranoia-thriller. 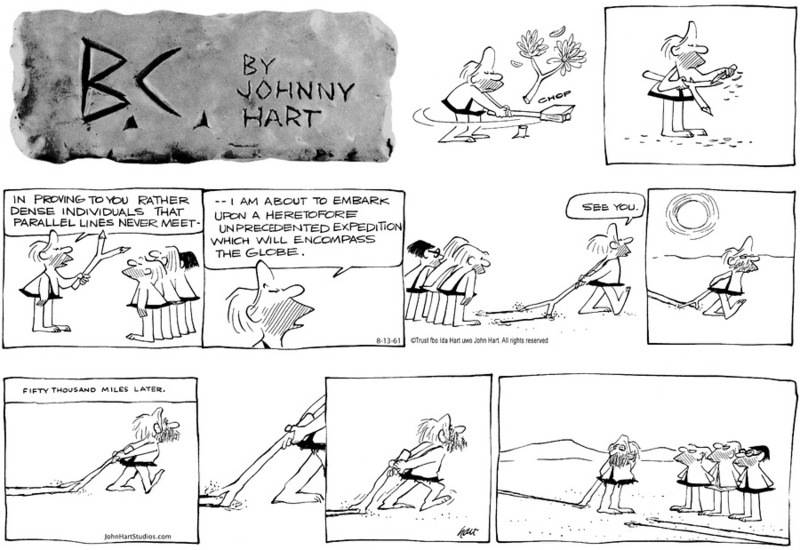 Johnny Hart’s Back to BC for the 29th is a surprisingly sly joke about non-Euclidean geometries. You wouldn’t expect that given the reputation of the comic the last decade of Hart’s life. And I did misread it at first, thinking that after circumnavigating the globe Peter had come back to have what had been the right line touch the left. That the trouble was his stick wearing down I didn’t notice until I re-read. But Peter’s problem would be there if his stick didn’t wear down. “Parallel” lines on a globe don’t exist. One can try to draw a straight line on the surface of a sphere. These are “great circles”, with famous map examples of those being the equator and the lines of longitude. They don’t keep a constant distance from one another, and they do meet. Peter’s experiment, as conducted, would be a piece of proof that they have to live on a curved surface. Johnny Hart’s Back to BC for the 29th of July, 2018. It originally ran it looks like, the 13th of August, 1961. Or I’m reading the second row, second panel wrong. 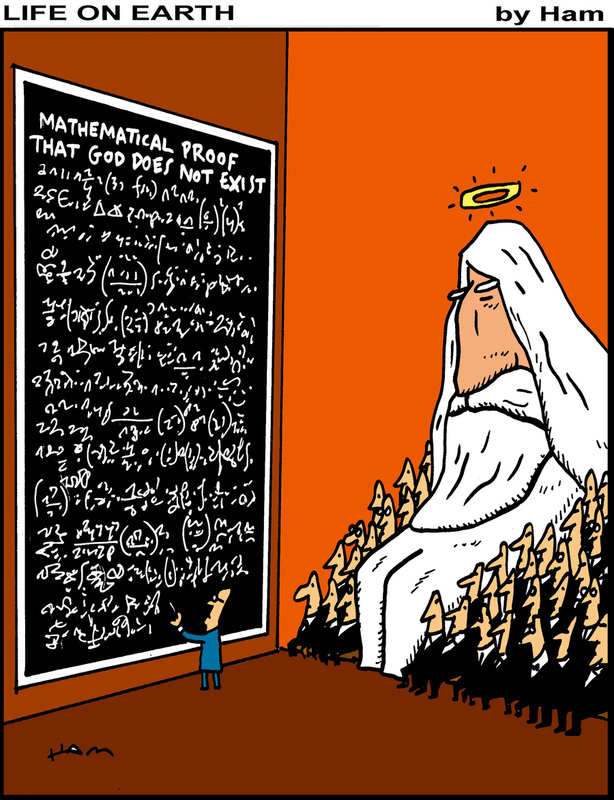 And this gets at one of those questions that bothers mathematicians, cosmologists, and philosophers. How do we know the geometry of the universe? If we could peek at it from outside we’d have some help, but that is a big if. So we have to rely on what we can learn from inside the universe. And we can do some experiments that tell us about the geometry we’re in. Peter’s line example would be one; he can use that to show the world’s curved in at least one direction. A couple more lines and he’d be confident the world was a sphere. If we could make precise enough measurements we could do better, with geometric experiments smaller than the circumference of the Earth. (Or universe.) Famously, the sum of the interior angles of a triangle tell us something about the space the triangle’s inscribed in. There are dangers in going from information about one point, or a small area, to information about the whole. But we can tell some things. Phil Dunlap’s Ink Pen rerun for the 29th of July, 2018. This one originally ran the 21st of August, 2011. 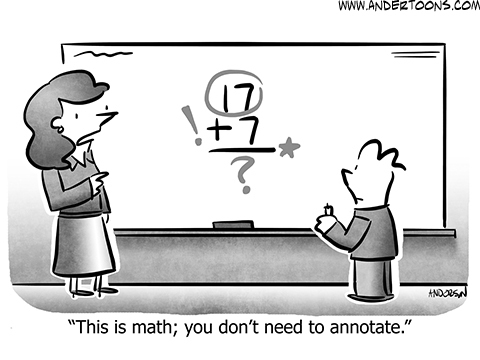 Phil Dunlap’s Ink Pen for the 29th is another use of arithmetic as shorthand for intelligence. Might be fun to ponder how Captain Victorious would know that he was right about two plus two equalling four, if he didn’t know that already. 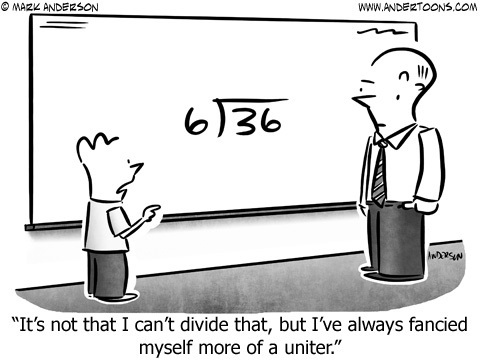 But we all are in the same state, for mathematical truths. We know we’ve got it right because we believe we have a sound logical argument for the thing being true. Brian Boychuk and Ron Boychuk’s Chuckle Brothers for the 30th of July, 2018. All right, so the rubber boat is an obvious anachronism. But Newton’s pal Edmond Halley made some money building diving bells for people to excavate shipwrecks and if that doesn’t mess with your idea of what the 17th century was you’re a stronger one than I am. Brian Boychuk and Ron Boychuk’s Chuckle Brothers for the 30th is a riff on the story of Isaac Newton and the apple. The story of Newton starting his serious thinking of gravity by pondering why apples should fall while the Moon did not is famous. And it seems to trace to Newton. We have a good account of it from William Stukeley, who in the mid-18th century wrote Memoirs of Sir Isaac Newton’s Life . Stukeley knew Newton, and claimed to get the story right from him. He also told it to his niece’s husband, John Conduitt. Whether this is what got Newton fired with the need to create such calculus and physics, or whether it was a story he composed to give his life narrative charm, is beyond my ability to say. It’s an important piece of mathematics history anyway. If you’d like more Reading the Comics essays you can find them at this link. Some of the many essays to mention Andertoons are at this link. Other essays mentioning B.C. (vintage and current) are at this link. The comic strip Ink Pen gets its mentions at this link, although I’m surprised to learn it’s a new tag today. And the Chuckle Brothers I discuss at this link. Thank you. 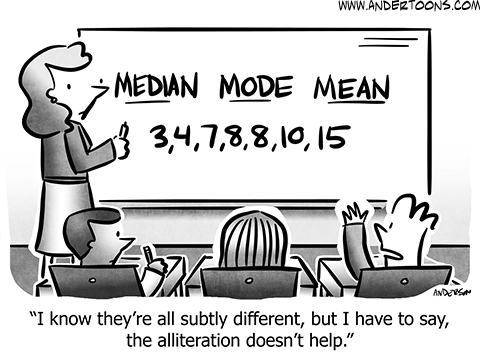 There were a bunch of mathematically-themed comic strips this past week. A lot of them are ones I’d seen before. One of them is a bit risque and I’ve put that behind a cut. This saves me the effort of thinking up a good nonsense name to give this edition, so there’s that going for me too. Bill Amend’s FoxTrot Classics for the 24th of May ought to have run last Sunday, but I wasn’t able to make time to write about it. It’s part of a sequence of Jason tutoring Paige in geometry. She’s struggling with the areas of common shapes which is relatable. 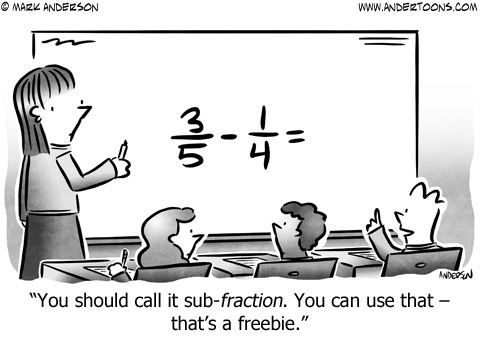 Many of these area formulas could be kept straight by thinking back to rectangles. The size of the area is equal to the length of the base times the length of the height. From that you could probably reason right away the area of a trapezoid. It would have the same area as a rectangle with a base of length the mean length of the trapezoid’s different-length sides. The parallelogram works like the rectangle, length of the base times the length of the height. That you can convince yourself of by imagining the parallelogram. 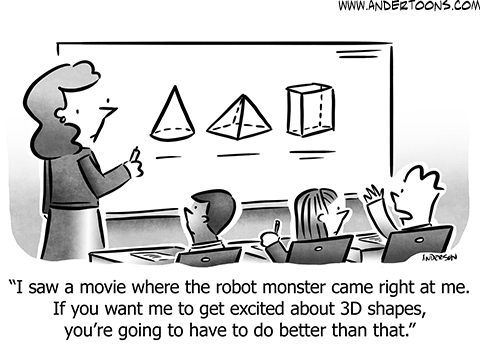 Then imagine slicing a right triangle off one of its sides. Move that around to the other side. Put it together right and you have a rectangle. Already know the area of a rectangle. The triangle, then, you can get by imagining two triangles of the same size and shape. Rotate one of the triangles 180 degrees. Slide it over, so the two triangles touch. Do this right and you have a parallelogram and so you know the area. The triangle’s half the area of that parallelogram. Bill Amend’s FoxTrot Classics for the 24th of May, 2018. It originally ran the 30th of May, 1996. The circle, I don’t know. I think just remember that if someone says “pi” they’re almost certainly going to follow it with either “r squared” or “day”. One of those suggests an area; the other doesn’t. Best I can do. Allison Barrows’s PreTeena rerun for the 27th of May, 2018. It originally ran the 15th of February, 2004. Allison Barrows’s PreTeena rerun for the 27th discusses self-esteem as though it were a good thing that children ought to have. This is part of the strip’s work to help build up the Old Person Complaining membership that every comics section community group relies on. But. There is mathematics in Jeri’s homework. Not mathematics in the sense of something particular to calculate. There’s just nothing to do there. 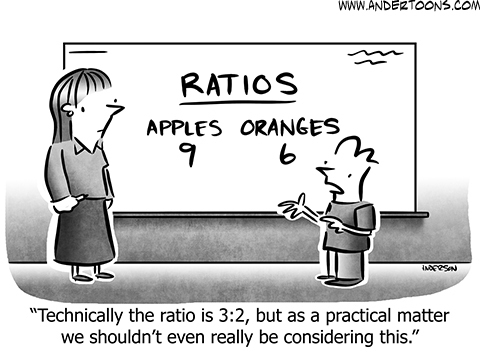 But it is mathematics, and useful mathematics, to work out the logic of how to satisfy multiple requirements. Or, if it’s impossible to satisfy them all at once, then to come as near satisfying them as possible. These kinds of problems are considered optimization or logistics problems. Most interesting real-world examples are impossibly hard, or at least become impossibly hard before you realize it. You can make a career out of doing as best as possible in the circumstances. Charles Schulz’s Peanuts rerun for the 27th features an extended discussion by Lucy about the nature of … well, she explicitly talks about “nothing”. Is she talking about zero? Probably; you have to get fairly into mathematics or philosophy to start worrying about the difference between the number zero and the idea of nothing. 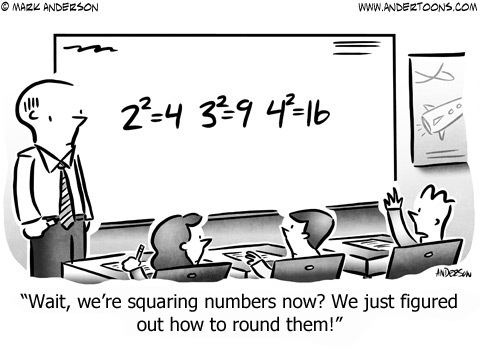 In Algebra, mathematicians learn to work with systems of things that work like numbers enough that you can add and subtract and multiply them together, without committing to the idea that they’re working with numbers. They will have something that works like zero, though, a “nothing” that can be added to or subtracted from anything without changing it. 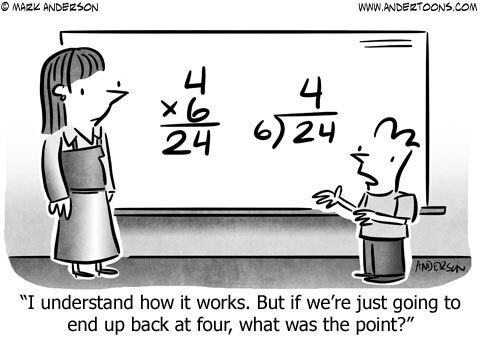 And for which multiplication turns something into that “nothing”. Charles Schulz’s Peanuts rerun for the 27th of May, 2018. It originally ran the 30th of May, 1971. This strip originally ran during a time when, in-continuity, the Little Red-Haired Girl had moved away and Charlie Brown was coping with having never spoken to her. At some point she moved back, possibly because Schulz felt he had done everything he could with that or possibly because he forgot she had moved away. 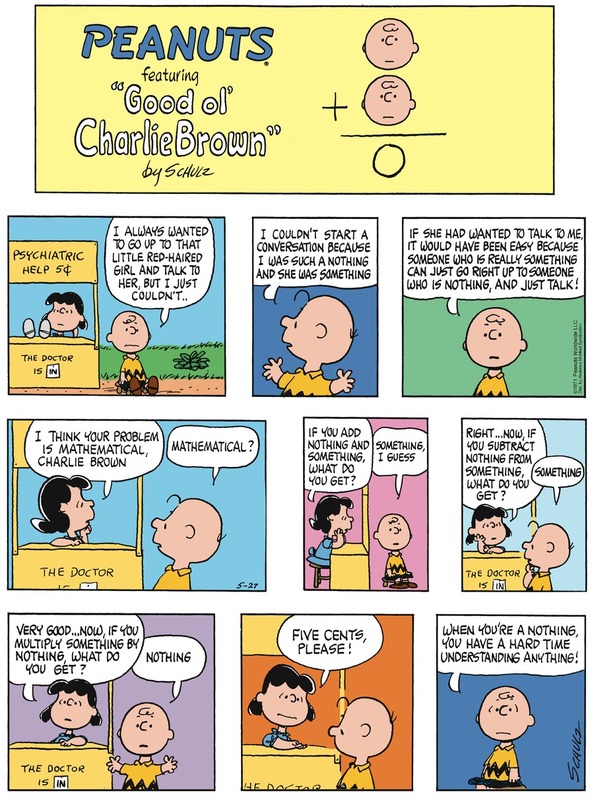 I’m with Charlie Brown in not understanding where Lucy was going with all this, though. Maybe she lost the thread herself. 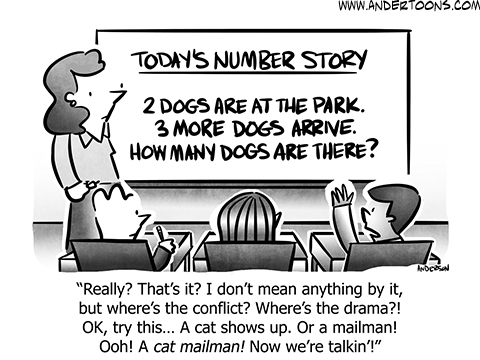 Mark Anderson’s Andertoons for the 28th is Mark Anderson’s Andertoons for the week. 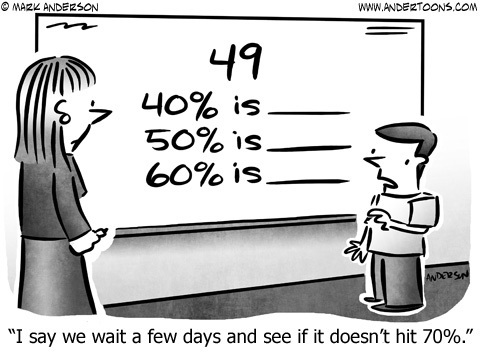 Wavehead’s worried about the verbs of both squaring and rounding numbers. Will say it’s a pair of words with contrary alternate meanings that I hadn’t noticed before. I have always taken the use of “square” to reflect, well, if you had a square with sides of size 4, then you’d have a square with area of size 16. The link seems obvious and logical. So on reflection that’s probably not at all where English gets it from. I mean, not to brag or anything but I’ve been speaking English all my life. If I’ve learned anything about it, it’s that the origin is probably something daft like “while Tisquantum [Squanto] was in England he impressed locals with his ability to do arithmetic and his trick of multiplying one number by itself got nicknamed squantuming, which got shortened to squaning to better fit the meter in a music-hall song about him, and a textbook writer in 1704 thought that was a mistake and `corrected’ it to squaring and everyone copied that”. I’m not even going to venture a guess about the etymology of “rounding”. Mark Anderson’s Andertoons for the 28th of May, 2018. But why would the examples be written out before the students were told what the were doing? Marguerite Dabaie and Tom Hart’s Ali’s House for the 28th sets up a homework-help session over algebra. Can’t say where exactly Maisa is going wrong. Her saying “x equals 30 but the train equals” looks like trouble to me. It’s often good practice to start by writing out what are the things in the problem that seem important. And what symbol one wants each to mean. And what one knows about the relationship between these things. It helps clarify why someone would want to do that instead of something else. This is a new comic strip tag and I don’t think I’ve ever had cause to discuss it before. Marguerite Dabaie and Tom Hart’s Ali’s House for the 28th of May, 2018. Relatable. Hilary Price’s Rhymes With Orange for the 29th of May, 2018. Pity whoever gets the center office, bottom layer. And now here’s the strip that is unsuitable for reading at work, owing to the appearance of an undressed woman.